Phosphoric acid, a common food additive, has been associated with decreased bone mineral density. A colorless, odorless substance, it is used in fertilizers and detergents as well as foods and beverages. Its purpose in the food industry is to give a sharp flavor to food or to serve as a preservative. The most widely consumed source of phosphoric acid is soft drinks. Phosphoric acid is responsible for the characteristic biting taste associated with colas. Clear sodas contain citric acid instead of the phosphoric acid found in colas. In addition to colas, many sports drinks, bottled teas, punches and fruit-flavored beverages contain phosphoric acid. 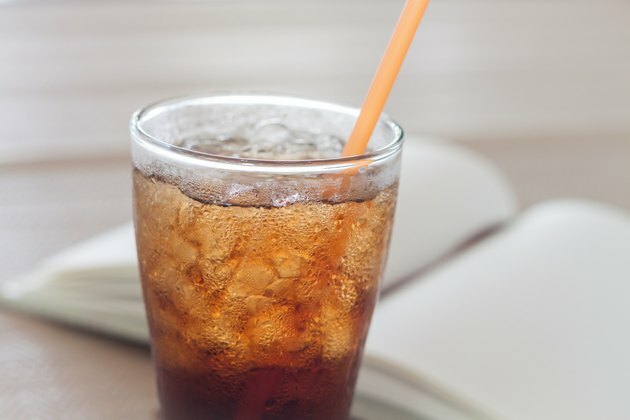 A study published in 2006 in the "American Journal of Clinical Nutrition" found that colas, but not other carbonated beverages, are associated with lower bone mineral density in women, suggesting that the phosphoric acid may have a negative effect on bone health. The salts of phosphoric acid are used in many dairy products to modify the proteins and alter the pH to produce a higher-quality product. The addition of phosphates derived from phosphoric acid to cheese results in smooth, shelf-stable products. Phosphoric acid or phosphates can also be found in milk, buttermilk, cottage cheese and nondairy coffee creamers. Phosphoric acid salts are combined with baking soda to produce baking powder, a leavening agent found in many baked goods. Baked goods that are leavened with baking powder instead of yeast will likely contain phosphates; these will be in the ingredient list on the food package. Other processed foods that may contain phosphoric acid include breakfast or cereal bars, flavored waters, bottled coffee beverages and processed meats. Many fresh meat and poultry products are enhanced with salt solutions to increase their moisture and flavor. These solutions also contain phosphoric acid or phosphate salts. Read ingredient lists on food packages to identify phosphorus-containing food additives, such as dicalcium phosphate, hexametaphosphate, sodium phosphate and tricalcium phosphate.